First Timers Reception: Wednesday 2 July 2014 5pm Crucible Theatre: We are inviting all First Timers to your very own drinks reception from 5-6pm – just before the Wednesday keynote at the Crucible Theatre. To find your conference buddies and be introduced to our Advisory Committee members and CMC regulars, sign up to the First Timers reception when you register. The main conference venue is the Showroom Cinema in Sheffield. The cinema is a short walk from Sheffield railway station. On arrival you can walk from the station to the venue and register all in about 15 minutes. Your first stop is the Registration Desk in the Workstation (next door to the Showroom). You can pick up your badge here and come back any time to the Registration Desk for assistance. The cloakroom and luggage check is also in the Workstation. The Wednesday Workshops are not only informative; they are great place to meet new people as they almost always entail some group work. Lunch starts at 12noon and the Workshops start at 1pm. The International Exchange is in the Millennium Gallery. It opens at 8.30am on Weds 2nd July. The Pizza Express supper is a great way to meet people: it’s informal, great fun and we definitely recommend booking if it’s your first time in Sheffield. Your delegates pass gives you access to the Keynote events on Wednesday evening and Thursday evening (in the Crucible Theatre) and all the conference sessions in the Showroom and HUBs. Your printed delegate guide provides information on the content and timing of all the sessions at the Conference, allowing you to plan your time. 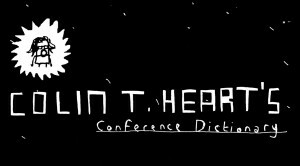 You can also use the website in advance of the Conference. The full programme is published in June. Some sessions will be busy and we operate on a first come, first served basis, so remember to get to sessions in time. The Showroom Bar is our social centre. It’s where all delegates and most speakers will hang out during the conference. Have a coffee and you will be bound to meet up with new conference friends. At lunchtime most delegates will us ually be in the HUBs building. You can pick up a lunch pack there and spend your lunch breaks networking.